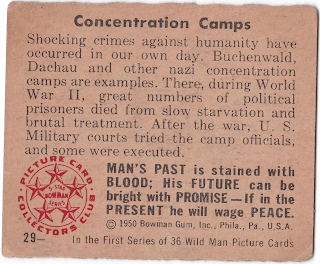 Back before my dad's time, one Philadelphia company served as America's premiere gum card maker, creating a multitude of sets spanning the WWII era. Sport sets included baseball, football, and basketball. Non-sports included pop culture, war machines, and law enforcement. Kids liked all kinds of things, so they made all kinds of cards. 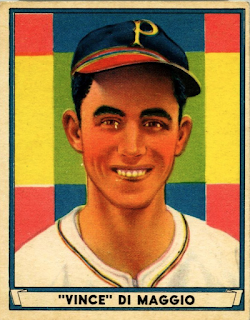 Founded as Gum, Inc. and later renamed Bowman Gum after founder Jacob Warren Bowman, the brand name ("Bowman, Home of the Rookie Card") lives today under the Topps umbrella. This post covers five vintage Bowman sets that proved key to card history and design. Baseball and sports cards didn't dominate the vintage gum card market like they do today, so I try to show how non-sport and sport blazed trails for each other. 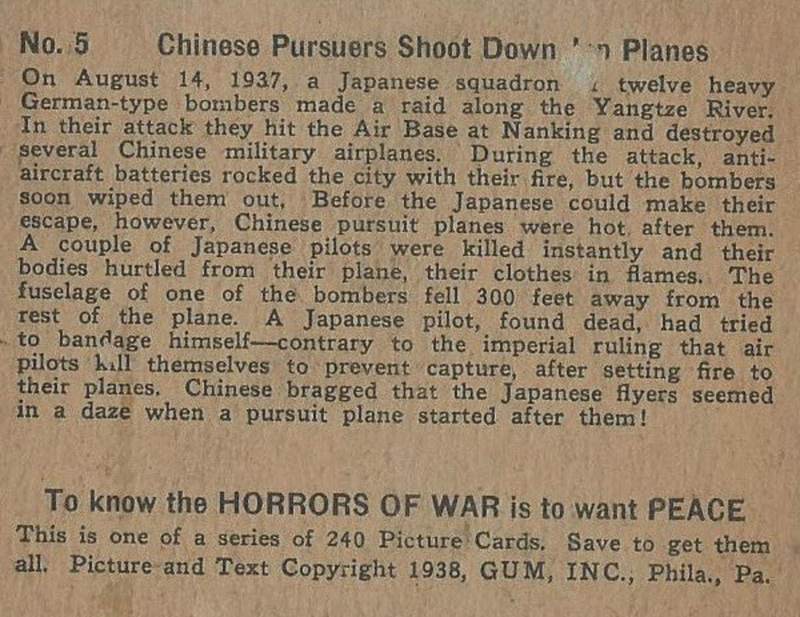 In the mid-1930s, fascist-led conflicts (Spain's Civil War, Italo-Ethiopian War, Sino-Japanese War) brought death and destruction onto headlines and into wax packs. 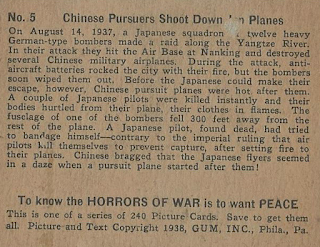 Gum, Inc. led that effort by selling kids over 100 million colorful and shocking war cards on a size and card stock similar to Goudey's well-known baseball sets. 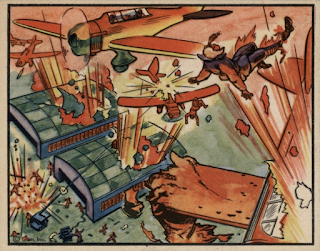 Every card shows something happening, like this pilot thrown from the fuselage of his exploding plane. Horrors of War's first series (#1-240) proved popular enough to spawn a second series highlighting the threat of Nazi Germany (#241-288). 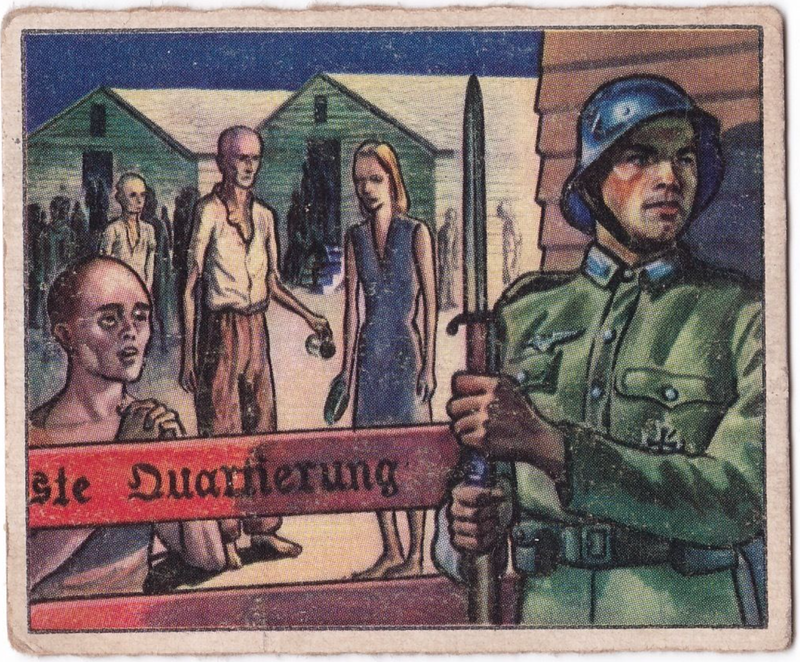 All cards professed, "To know the HORRORS OF WAR is to want PEACE." "War Gum," as kids called it, sold so well that it remains available and popular today. Goudey Gum, their top 1930s competitor, responded with two middling sets of military themes. Based on what's available in the market today, neither matched the popularity of Horrors of War. 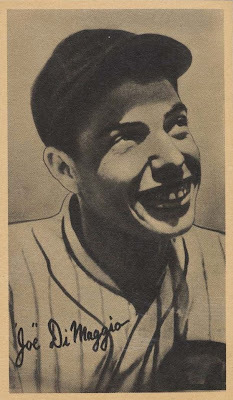 Buoyed by the success of Horrors of War, Gum, Inc. soon pushed into the baseball market. 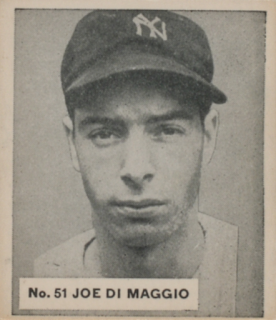 I've profiled the Play Ball sets before and my Collecting Joe DiMaggio in Yankee Pinstripes post shows all three. 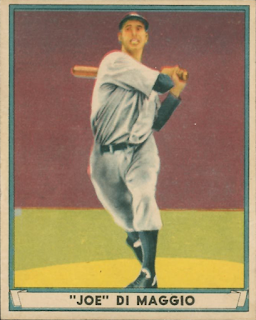 They're clean and popular, best known for early cards of Ted Williams and the Clipper. My favorite card's another DiMaggio, "Patchwork Vince." 1941 Play Ball's checklist numbers 72 cards, but modern researchers believe Gum, Inc. added 49-72 as a new series for 1942, reflecting the fan fever Ted Williams and Joe DiMaggio generated in 1941. That makes Vince part of its second series and reflects the practice (also used by Goudey & National Chicle) of selling and adding to the same set design across multiple years, rather than a single baseball season. See this article by Rich Mueller for more. 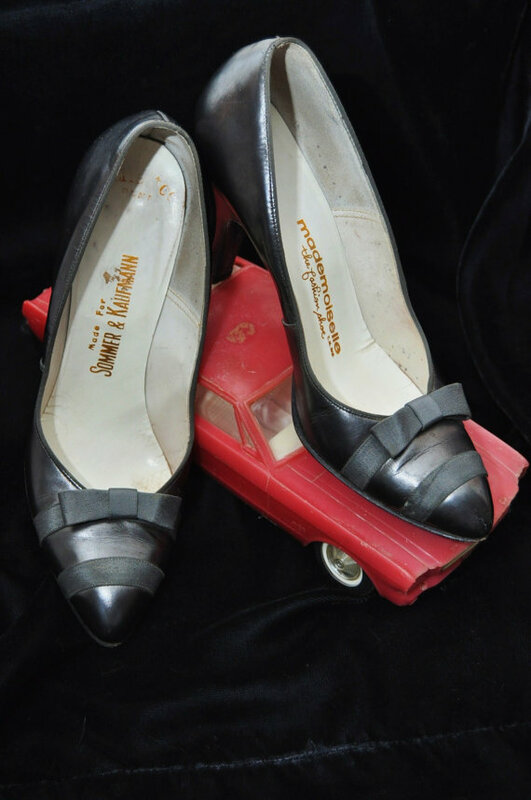 Bowman's founder endured multiple lawsuits thanks to Gum, Inc's success and its drive to cut production costs. 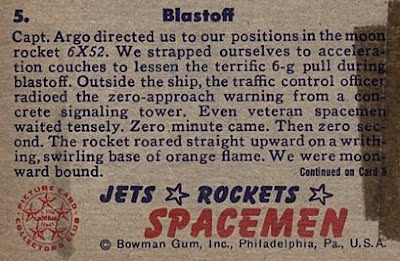 I suspect that for both legal reasons and wartime production needs, it made sense to rebrand as Bowman Gum, distinguishing them from other gum makers. 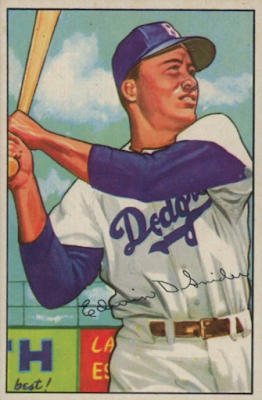 When they reentered the market in 1948, Bowman's name appeared on all card backs: baseball, football, basketball, and non-sports. From "1948 Bowman Baseball Packs Sell for $521,180"
The company's return to baseball in 1948 showed the same black-and-white look as 1939, dropping their hand-colored 1941 style. As the recent find of unopened packs show above, Bowman continued to use the "Play Ball" name in 1948. 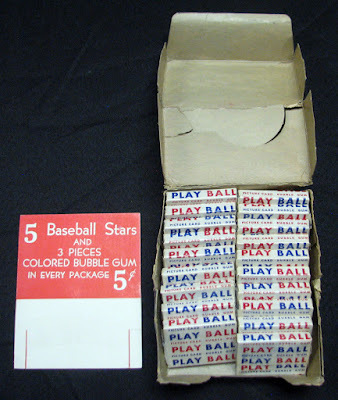 They changed to "Base Ball Bubble Gum" for 1949 and beyond. I'm combining these sets into one sequence, given their evolutionary design impact. Like many vintage collectors, I discovered Bowman baseball through the artistic excellence of their 1950-52 sets. 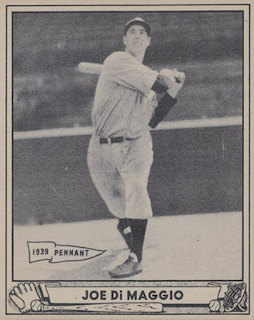 Unlike 1952 Topps and Sy Berger's kitchen table, Bowman's design didn't emerge whole cloth from a single source. Bowman's non-sport gum packs sold best during baseball's offseason and they developed this artistic look starting with 1949 Wild West, itself inspired by the post-WWII popularity of 19th century Western nostalgia. 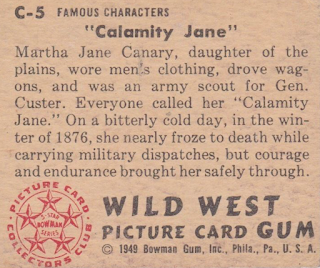 Wild West used the same 2¹⁄₁₆ by 2½ size as their 1948 and 1949 baseball cards, with hand-painted art that mimicked existing Western art and photos. Next up, the history and retrospective 1950 set "Wild Man." 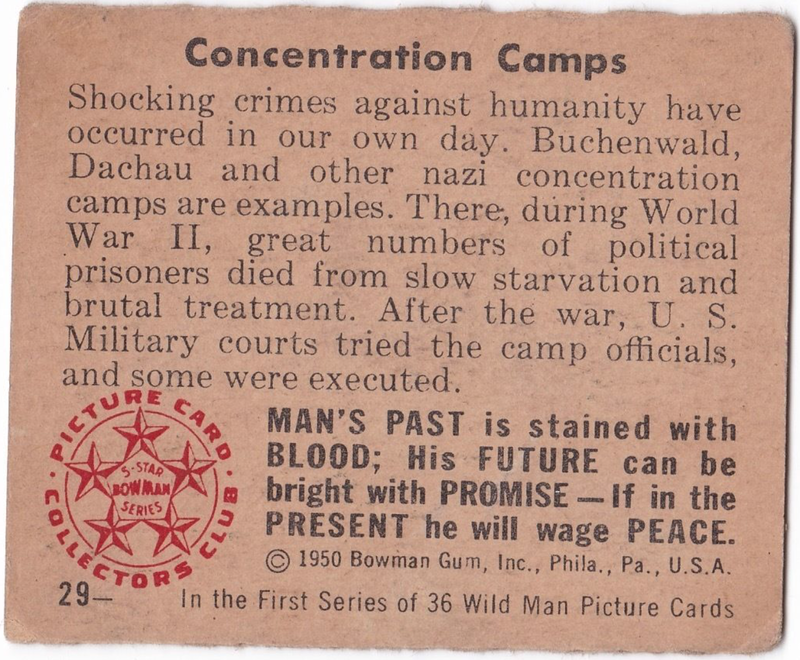 In the same way Bowman's 1948 baseball set harkened back to their 1939 design, Wild Man looked back to 1938 Horrors of War. 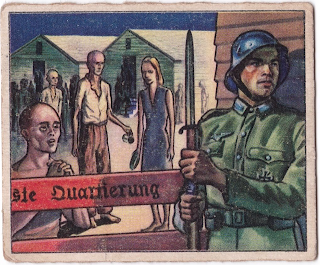 Card fronts show humanity's history of murder, danger, and conflict. Card backs once again emphasize the need for peace. 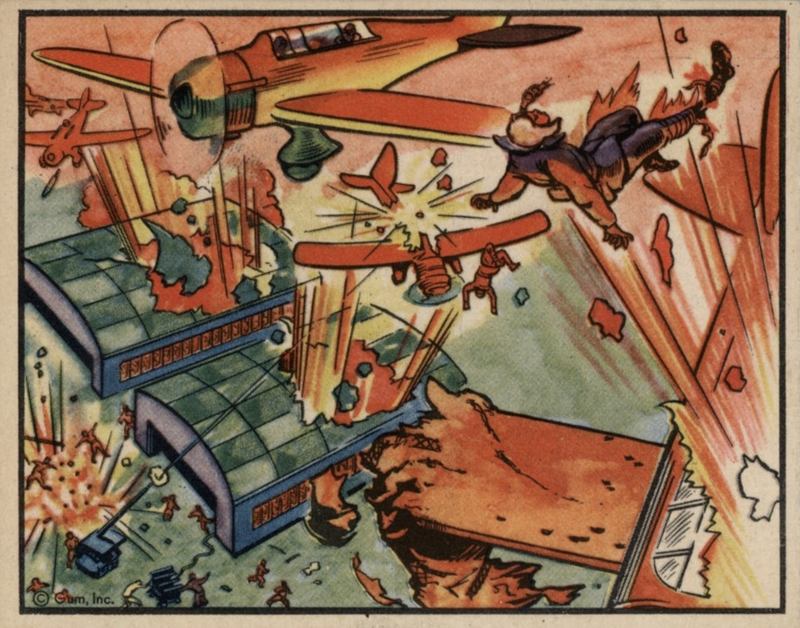 Third, there's 1951 Red Menace. Thanks to America's entry into the Korean War, the era didn't feel peaceful. Fear of the Communist "Red Menace" inspired Bowman to sell a set by the same name. 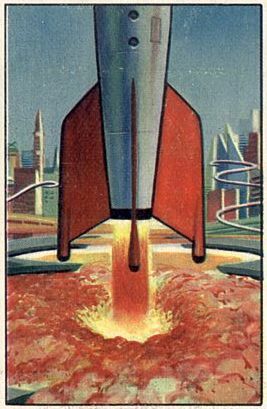 Slightly larger (2½ × 3⅛) than their 1949-50 sets, this would be their last squarish design before making cards longer and rectangular. 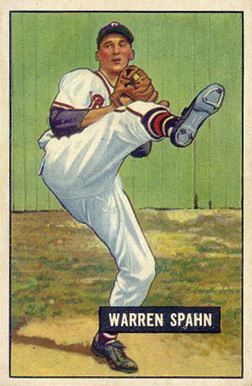 It's worth noting Topps competed with Bowman in war before they competed in sports. 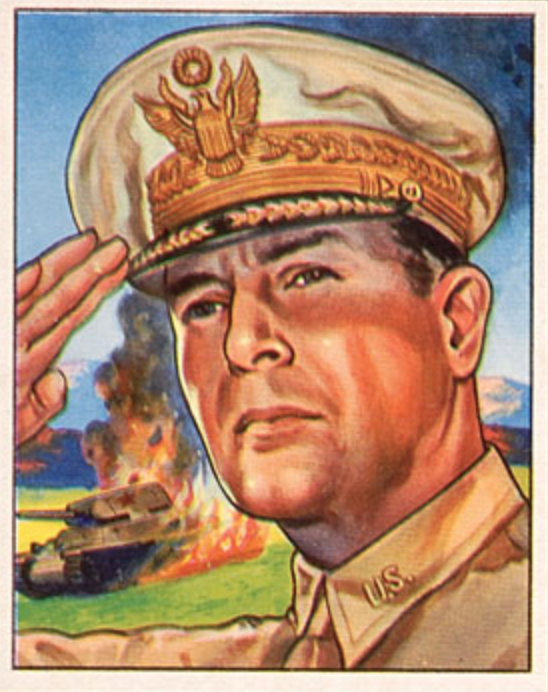 Red Menace came about in part because Topps struck a candy store hit with Freedom's War in 1950, a 203-card set of military hardware and figures active in WWII and Korea. 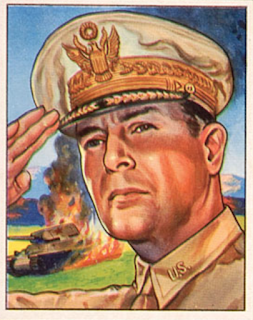 Topps used high quality art on Freedom's War and tested innovations like die-cuts to create tanks that could stand up. While this didn't push baseball design forward yet, it did push Bowman design forward. More great art appeared on new, bigger (2¹⁄₁₆ × 3⅛) Bowman cards in Jets, Rockets, Spacemen. You won't find any static, stoic poses in this set. #5's alive with the thundering moment of launch. Jets, Rockets, and Spacemen told a story about Capt. Argo and his crew that covered nearly the entire 108-card set. Read them all via scans in the JRS section of Lowell's Place. 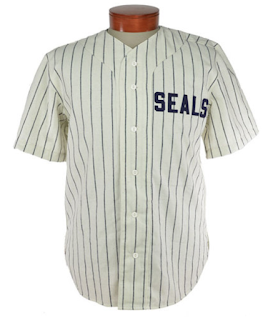 Their elongated look carried over to 1951 baseball -- or maybe the sets coexisted as nerds and jocks of the candy counter. Even when Bowman's 1951 baseball cards reused 1950 pictures like Warren Spahn above, the different dimensions brought you closer to the player. 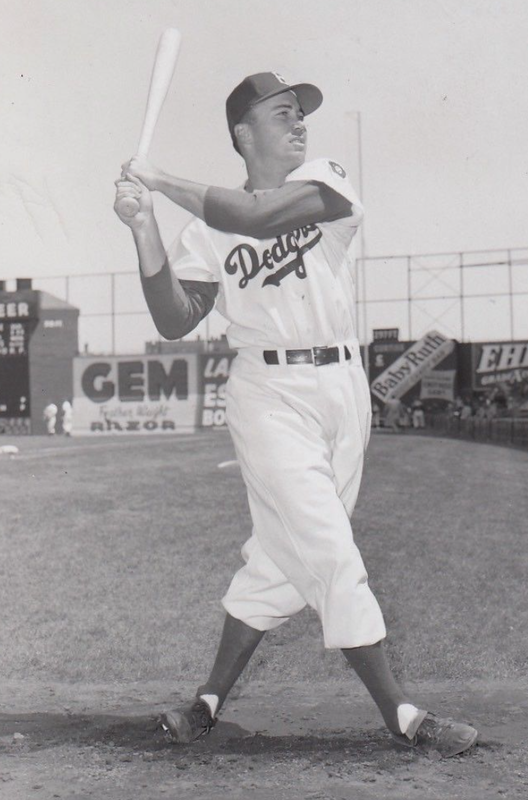 My dad became a baseball fan in the 1950s because of this guy, Duke Snider, shown with his original photo, and I've been lucky enough to inherit some of his own Snider cards. 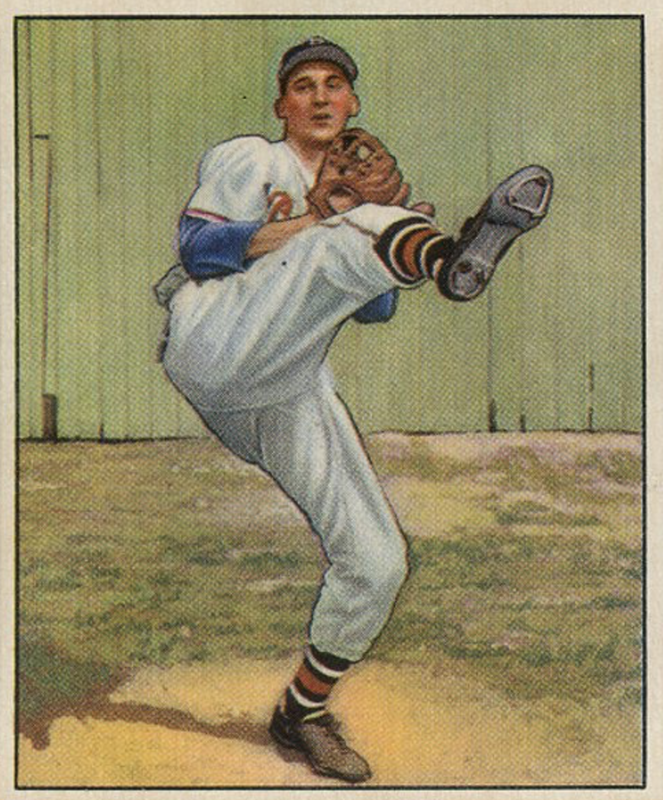 Bowman's artist added clouds and tweaked the fence to accentuate Duke's placement in the top 2/3 of the card. 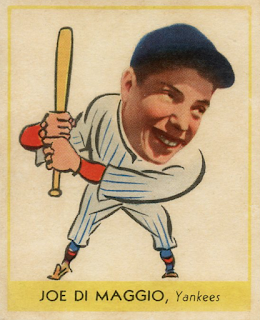 Topps' huge success with their 1952 set ended Bowman's baseball self-determination. They shifted to competing with Topps for player contacts and overextended financially trying to print bigger cards with better photos. Just four years later, they called it quits and sold all player contracts, designs, and trademark assets to Topps. 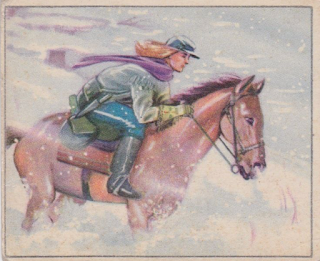 I'd like to see the alternative timeline where Bowman's artistic sets survived in the market alongside photo cards. Today, that might happen, given the age range and varied tastes of collectors. The nickels and pennies 1950s kids spent on chewing gum just couldn't support both. Two years after the 1934 trade, Goudey used the above snap (itself a SF Seals photo from 1934) as both his 1936 "wide pen premium" and (head only) for 1938 Goudey #250 & #274, cards with identical design apart from the surrounding cartoons. By 1938, that crop-top made it impossible to know you're looking at a 1934 Pacific Coast League photo. Between those years, some sets did show Joe as a "real" Yankee. 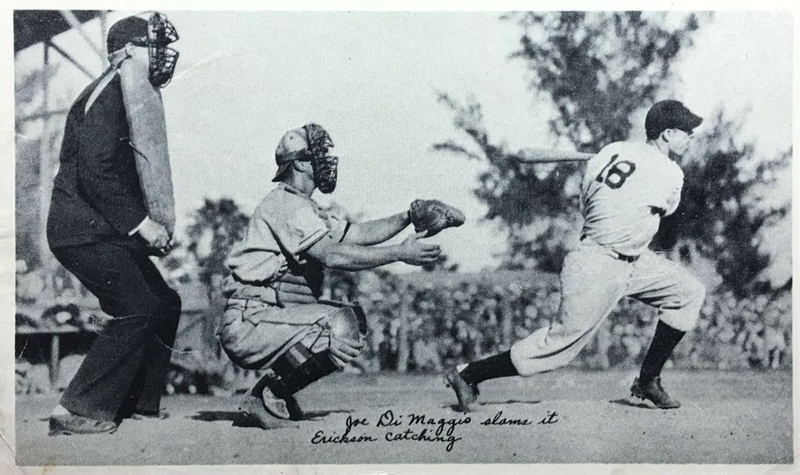 First issue: 1935 National Chicle fine pen photo premium ("Joe DiMaggio slams it") shows Joe's first spring training with New York, debuting as #18 before adopting his famous #5. Second issue: Canada's 1936 World Wide Gum #51, which serves as Joe's first bubblegum card. It's seldom seen outside elite collections today, given comparative rarity to American sets and baseball's enduring demand for the Clipper. 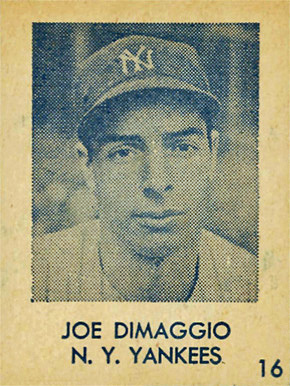 1939 Play Ball was the first American company to pack Joe D with slabs of gum and they gave him a nice, sharp photo for our patience. But no pinstripes. 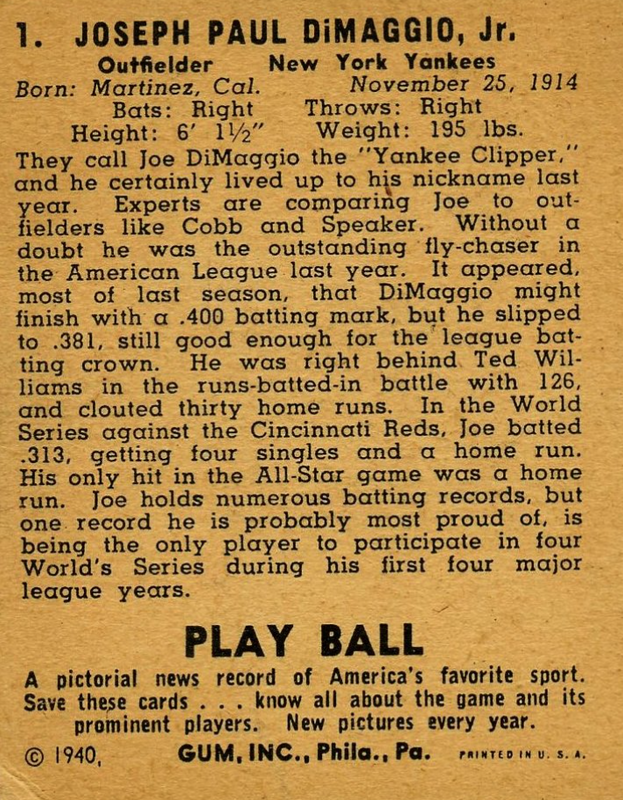 Play Ball followed up by giving Joe their #1 spot for 1940. 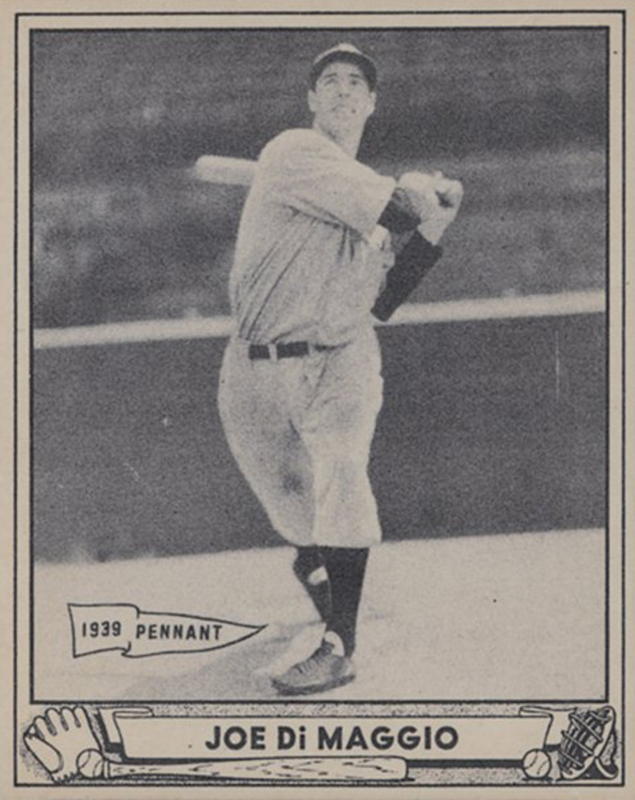 That on-card "1939 Pennant" hints that their card fronts wrapped up before the conclusion of 1939's World Series, while the back text wrapped up after the Yankees won their 4th consecutive title. Printing cards must've been a time-consuming business circa 1939-40. 1941 Play Ball repeated 1940 Play Ball's road gray jersey in hand-tinted color. 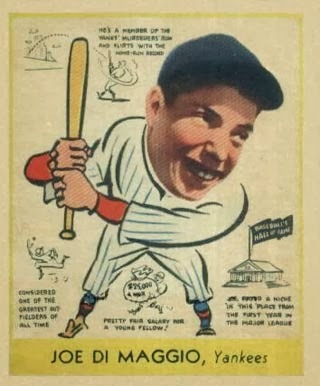 In fact, Play Ball never showed Joe in pinstripes, perhaps because the Gum, Inc. photographers only saw him when the Yankees played the A's in Philly, as AL opponents of that era. 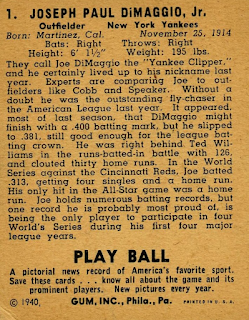 ...there it was, the 1948 R346 "Blue Tint" (set profile) a checklist heavy with New York teams and stars. Given the prohibitive rookie price of 1936 World Wide Gum cards, this deadpan DiMaggio's your best shot of getting a home pinstripes Joe from his 1936-1951 career span. If only he'd played 3 or 4 years longer, imagine all the classic Topps cards you'd have to choose from! 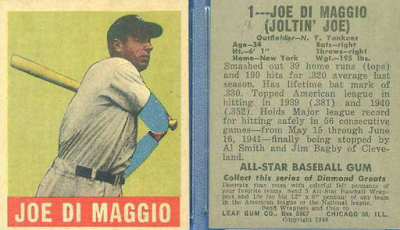 Value: Based on eBay results, R346 DiMaggio sells for $200, pushing Gehrig for top billing in that humble two-color set. Fakes / reprints: DiMaggio's counterfeited in almost all of his vintage sets, so know your dealers if you're collecting type cards or go for graded examples to minimize risk of fakery. A decade-plus into my type collection, subsets of it are close to complete, if challenging to close out entirely. 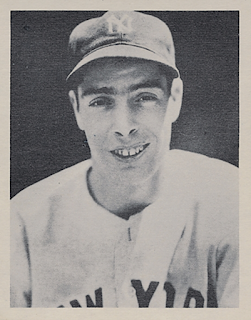 I'm almost done with 1940-49, made closer still by this latest Pacific Coast League pickup. With Al Lien's card in my pocket, I'm done with 1940s domestic issues! All remaining 1940-49 #5s are from Latin America and Japan. 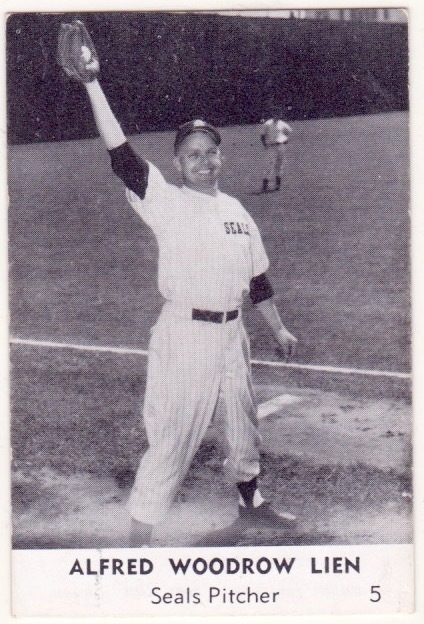 Smilin' Al's sporting the Seals pinstripe uniform, a typical choice when playing at home, compared to a team's plainer "road grays." I'm not convinced it's San Francisco's home stadium, though. So where's Al throwing that ball around? The high left field fence over his shoulder doesn't look like SF Seals Stadium, which featured ads along that wall. Based on a look through available PCL outfields, I think that's Sicks Stadium in Seattle. 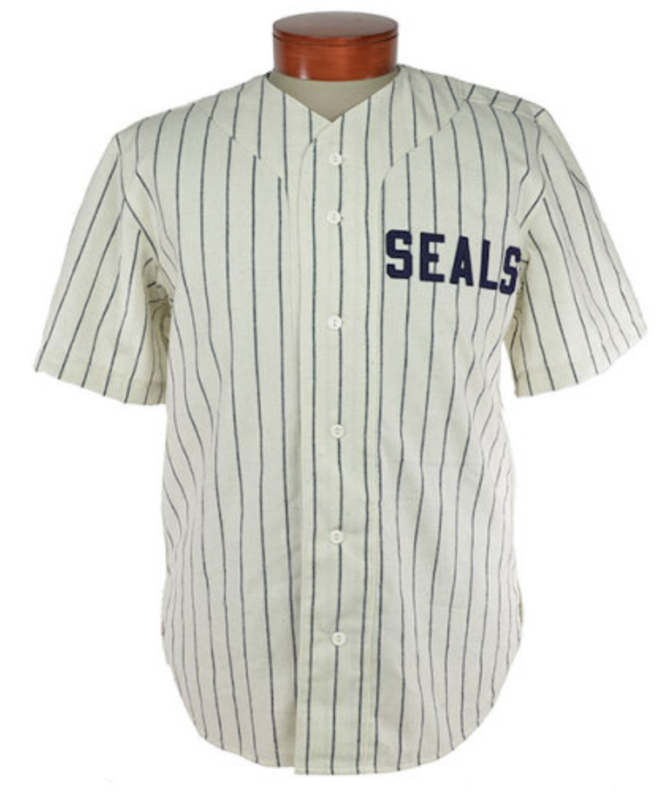 Built in 1938 and short on MLB-class amenities like "water pressure" and "reliable toilets," Sicks still managed to host the Pilots in their ignominious 1969 season after three decades of Seattle Rainers PCL teams. 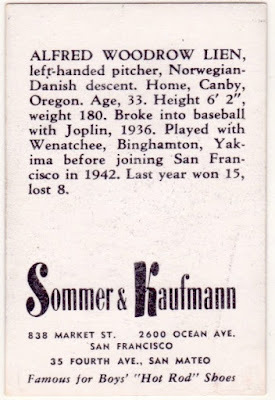 I wrote about Sommer & Kaufman once before, well before I owned the actual card. This scan shows its auburn tint better than that post's black & white scans. What of the card itself? "Norwegian-Danish descent" describes a lot of my family, so perhaps we're distant cousins! Sommer & Kaufmann, on the other hand, sounds as German as "Ich bin ein Berliner." (German via American, that is.) Their store's shoes covered more than boys' feet, as evinced by these brand label pumps. I think a single card printer created all of the Bay Area's minor league team sets and then branded backs with sponsor info. S&K's card design mimics contemporary PCL sets like Remar Bread (1947 set profile) and Smith's Clothing (1947 set profile), but Sommer & Kaufmann singles prove much tougher to come by. I'd seen just a handful prior to one of my favorite dealers breaking up a complete set in mid-2017. That kind of thing won't happen every day, so don't wait if you get a good shot at a type card from a dealer you trust. Value: This EX card cost me $80, at the high end for commons, and my price paid reflects its scarcity and the hole in my wantlist. If I go hunting for another, it'll be for something closer to $40-50. Fakes / reprints: With no stars in the set itself, there's low risk of one faked card. You're more likely to see counterfeit sets priced for big money. Authentic singles feature a shiny finish on white stock that's thinner than your average Topps card. The Smith's and Remar PCL sets prove easier to come by, so you can start with those and then add Sommer & Kaufmann once you're familiar with the style. Following my luck with dollar boxes during the 2017 National Sports Collectors Convention in Chicago, I'm trying a new kind of blog giveaway. If you guess it, you get it. WHAT: I have two 800-count boxes of duplicates from the 1950s to 1970s. Many are bargain box finds, including high numbers and stars, not just your run-of-the-mill guys. 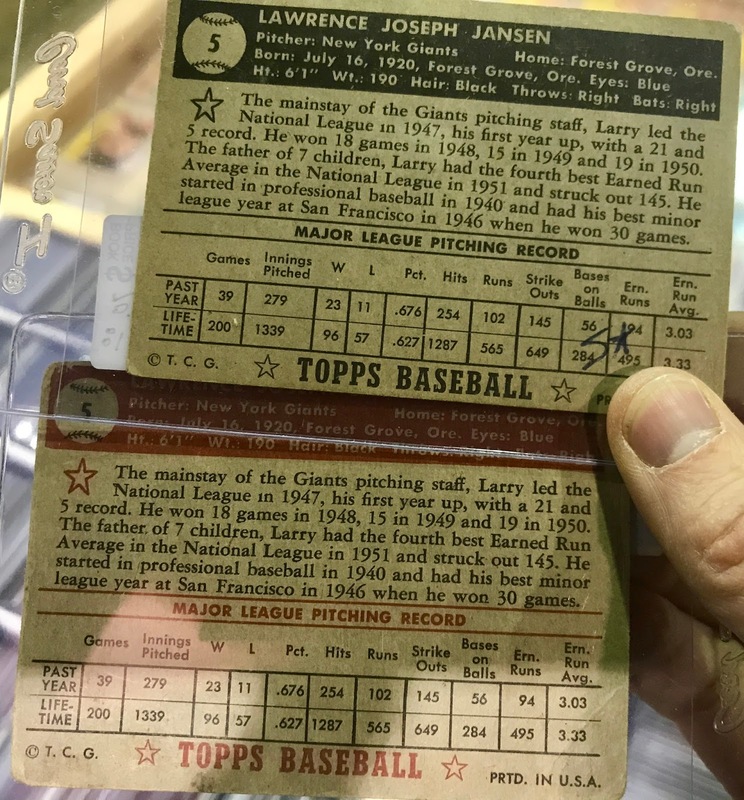 "My guess: 1957 Topps 52, 1964 Topps 105 / 299 / 350, 1972 Topps 600"
WHEN: Contest runs through end of Wednesday, August 16. After the contest closes, I'll check each of the posts and if you guessed a card that's in my dupes box, it's yours! As a helping start, I don't have any duplicate Mantles or 1952 high numbers. Beyond that, you might get lucky! 2017 set my new high water mark for hours on the National floor. Most years, I duck out for city sights at least one day, even at shows in Atlantic City. I skipped that tradition this year, as my "Chicago brother" moved west to Seattle earlier this year and I no longer have that connection to his Wrigley Field side of town. To keep a long story short, more hours on the National floor meant more cards came home with me! Each National show occupies a full week, Monday to Sunday. Monday's "set up day" for most dealers, as they bring trucks and cases full of products onto the floor through massive loading docks. Dealers spend a lot of Tuesday deep in buy/sell/trade negotiations with each other and I'm sure the corporate sponsors like Topps and PSA do a bunch of face-to-face business. Wednesday afternoon's the first day open to the public and I flew in midday from Boston to start shopping and catch up with fellow OBC collectors. Early highlights included these $1 box finds. National show floors comprise hundreds of tables and millions of things to throw money at. 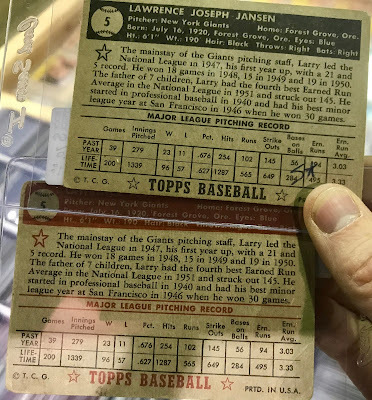 Single-minded collectors stick to their planned wantlists and budgets, despite temptations galore from all sports and eras. I am not that single-minded and wander within The Rules. I did OK this year. Number two's a problem because you need to stop for restrooms every now and then. (Heh heh, "number two" heh heh.) Despite my bladder's best wishes, there are not restrooms neatly placed at the end of every row. Not sure why, but you could find commons for under $5 at a bunch of tables. 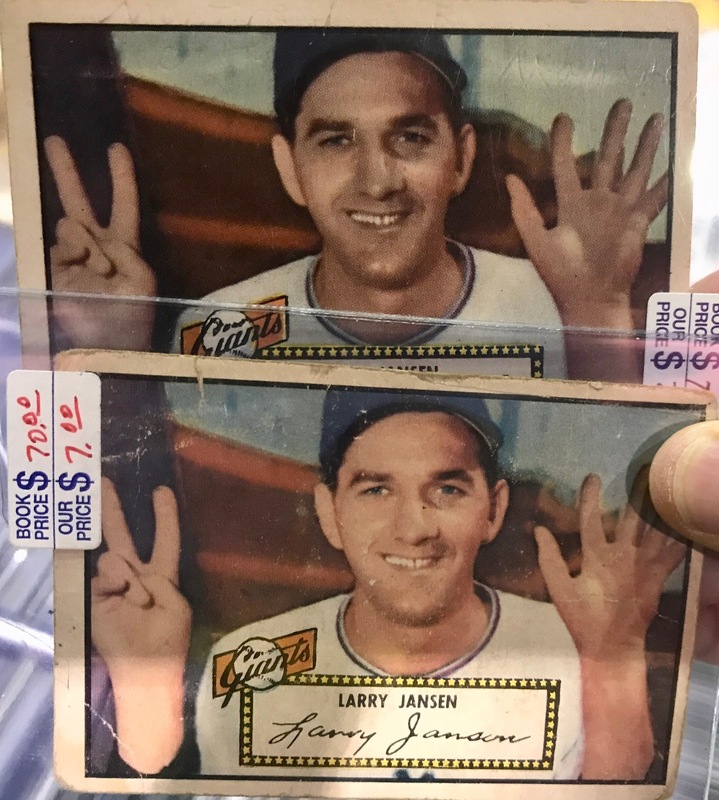 Over the past few years, eBay tilted closer to $7+ per card, so this was a pleasant surprise and enough reason to start a low-number 1952 set. I swung a pair of larger deals and bought 100+ cards for ~$3/card. Banged up 1930s appear to have jumped from $8/card to $12-20/card when I wasn't looking. Would've come up well short of my National goals if I hadn't been willing to pay more. Landed about two dozen hits in that "new price range" during the week. Biggest hit, 1933 World Wide Gum #84 of backup catcher & occasional spy Moe Berg for $70. A football-only dealer sold me a near-set (20/24) of the 1933 Sport Kings Varsity Football game for $400, $20/card. The card-flipping Varsity Football game remains hard to find at any show anywhere. Now I only need four cards to complete the game card set. Unfortunately, playing the game also required "score charts" I've never, ever seen. They'd bring to life the game situations described on card backs, probably by tracking down, distance, and time remaining. I'll make one up from scratch, if the authentic score chart search continues to prove futile. As exception to my 1930s woes, I made five hits to this 1933 Goudey 48-card set about the Scouts themselves and a variety of nature topics. Love the art style. If there's one enduring complaint I have about the National, it's that many dealers do most of their business buying & selling large lots with other National dealers, so grading and pricing for collectors becomes an afterthought. Other than Varsity Football, a $400 lot buy, my prewar sets saw limited action because things under EX had 30-50% NM book asking prices, even if tradition anchors poor ~5% and VG ~20%. I found myself back on eBay a few times during the show itself, buying cards on "real" condition pricing after seeing cloud-level show prices. There's not a true solution to my complaint, other than being willing to shop online instead of the booths in front of you. I assume that's why sponsors bring so many autograph guests to the show: you can't replicate that in-person experience online the way you can for cards, so you don't lose those buyers to eBay. Speaking of 50c/$1 finds like the three above, watch for a bargain box themed blog giveaway later this week! It's been too long since I held one. Anyone else make it to the National and have finds to share?